The Yi Peng festival is part of the Festival of Lights within Northern Thailand. The festival coincides with Lori Krathong, which is celebrated across the whole of Thailand. In most of Thailand people show their respect to Buddha by placing floating lights on water. 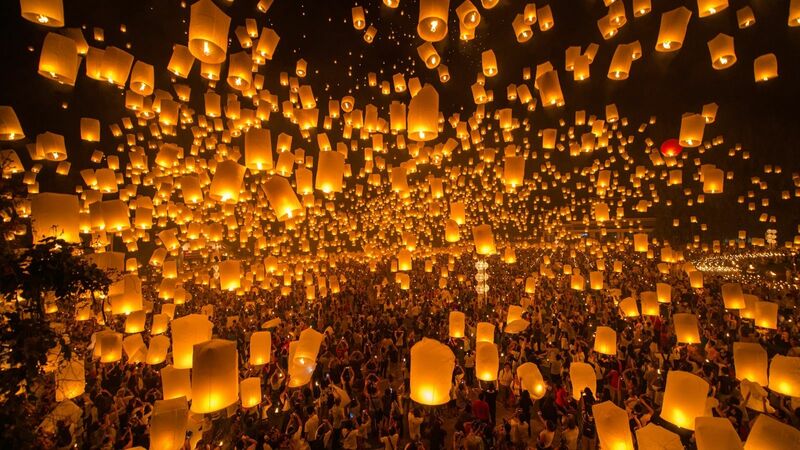 The Northern Thailand Yi Peng festival instead put lights into floating lanterns and release them into the air. As crazy festivals go, the Monkey Buffet Festival is pretty odd. Basically once a year in Lop Buri the people gather together lots of fruits and vegetables to feed the local monkey population. This festival takes place annually to celebrate the Catholic fest of Corpus Christi. 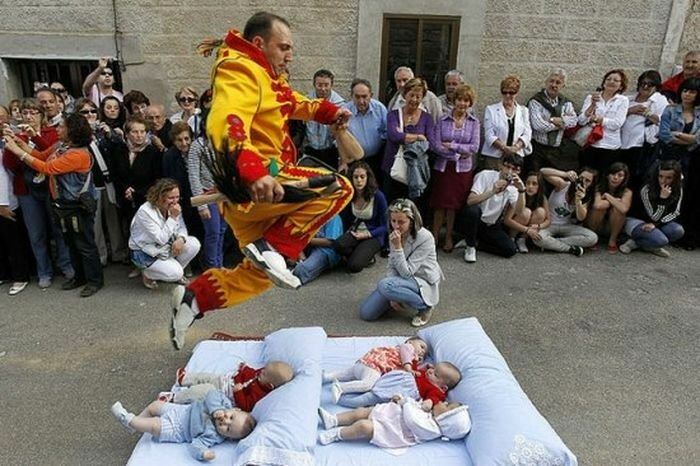 The festival involves men who dress like the devil and jump over the babies born in the previous 12 months. Definitely one of the more crazy festivals. 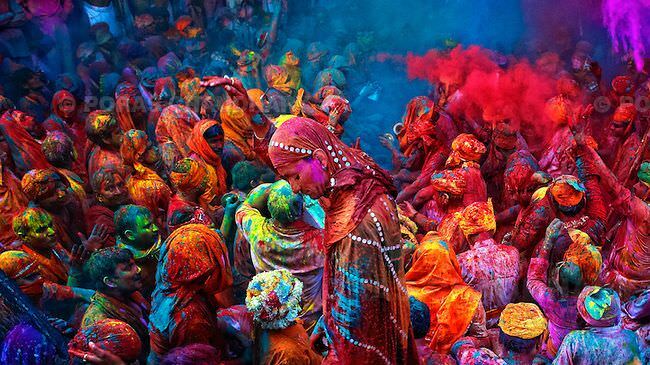 This beautifully colourful festival in India takes place in Spring and is known as the festival of colour/love. The festival was originally a Hindu festival but has been adopted by many non-Hindus now too. 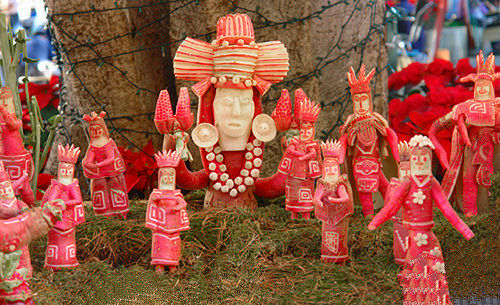 The festival signifies the victory of good over evil. This is perhaps one of the most crazy festivals as it involves people trying to inflict the most pain to themselves through body piercings. 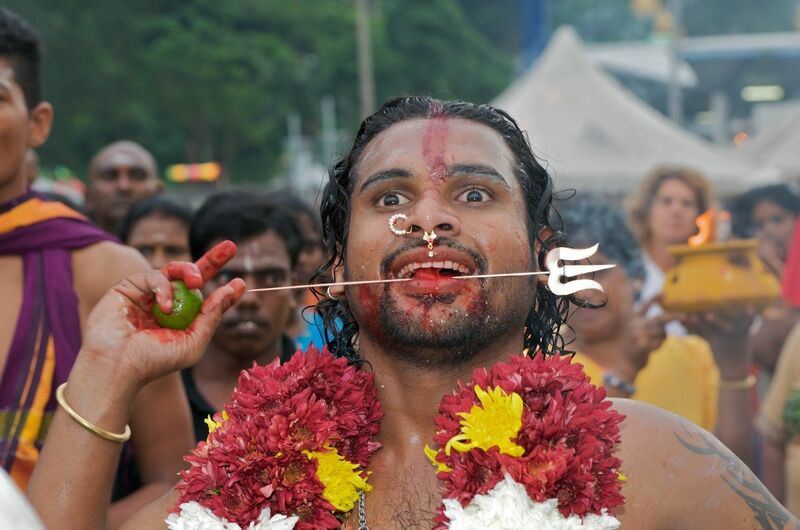 The practitioners in this Hindu festival believe that the more pain you endure the more you will be blessed. 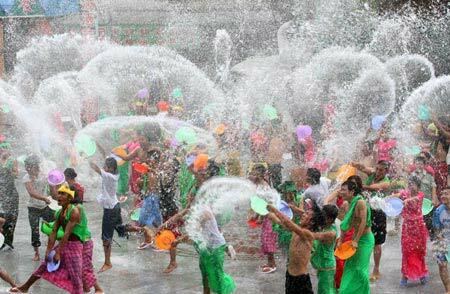 This Thai festival celebrates the New Year coming in every April by everyone soaking each other with water guns. Or, in some cases, using elephants to soak people! Sounds like one of the funnest crazy festivals. This festival takes place yearly in a small Spanish village. 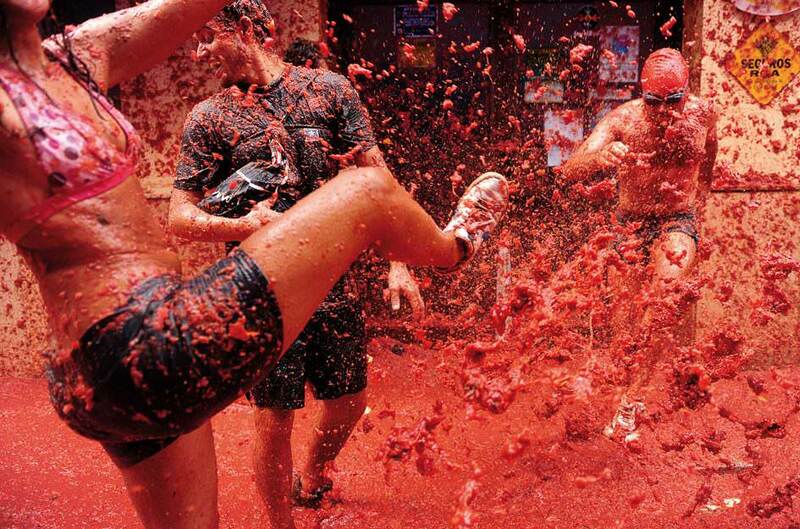 Basically for about an hour everyone has a massive tomato fight and makes a big mess. From tomatoes to mud – what is it with these crazy festivals? Interestingly this festival started as a marketing campaign for a cosmetics brand. Basically everyone gets together and has a big mud fight. You get crazy festivals, but this one is also a little creepy. Basically before Christmas every year shop vendors will bring out their best radishes and carve them into different shapes. Not only is this festival crazy, it’s also pretty dangerous. 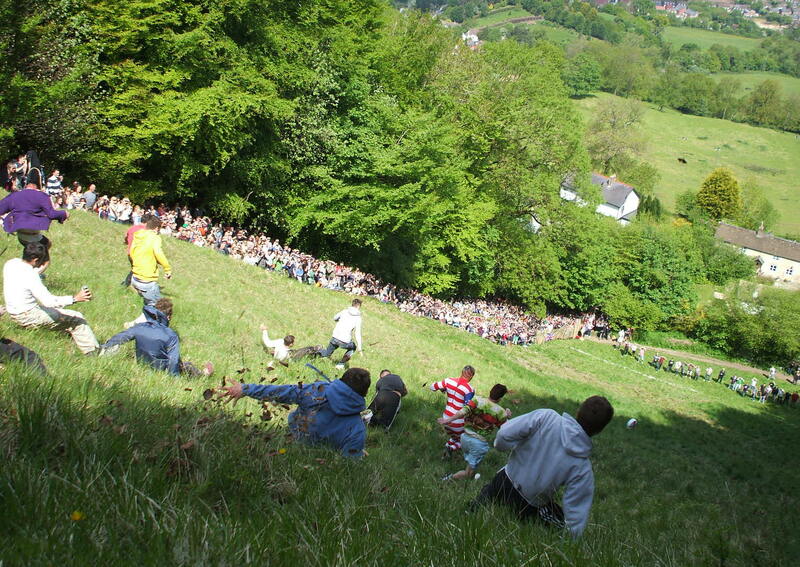 People gather once a year to try and outrun a giant ball of cheese down a hill. You can imagine there’s a few broken bones. Journalism graduate and 100% geek. I have worked in writing for the last 7 years as well as dabbling in a science laboratory. So if I ever stop writing, it's because I've been in a lab experiment and turned into a super villain. I'm particularly interested in video games, comics and Harry Potter. Oh and I have lots and lots of cats. Next articleThe 6 Funniest Things To Happen During An Exam – #3 is a Nightmare! 8 Harry Potter Theories That Are Pretty Crazy But You Might End Up Believing Them! Ellie Goulding Showcases Her New Hair Colour! How Many Other Celebs Have Dared to Go Orange? When you need to get someone off a plane to save their relationship, you know what word you're going to use! The Best (and Worst) Celebrity Wedding Dresses of All Time – Oh, Dear Mariah! Which celebrity looked like a princess on their wedding day, and who looked more like a giant meringue? We have the answers! From random impossible pictures of invisible dog walkers, to cute baby foxes and truly terrible breakfast diets, some of these random entries in textbooks are just baffling. Have a scroll through these images and discover some of the most random and hilarious things found in textbooks.